The HPX-1 Digital Plate Carrier offers users a new way to scan small or irregular shaped imaging plates using your HPX-1 Digital System. Specifically designed to be easy to use, in minutes you’ll be up and running. No matter what the shape (as small as 1”x1”) the carrier will deliver. You can also use the Carrier to combine multiple plates into one scan and improve your overall throughput. The Carrier comes complete with a protective case and simple instructions for use. 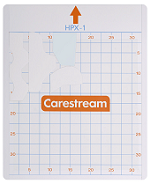 Enhance your HPX-1 experience and improve productivity with Carestream’s new HPX-1 Carrier!